I like what Radwan Tajeddine (Cornell University) has to say about recent work on Saturn’s moon Mimas. The lead author of a paper on the subject in Science, Tajeddine compares recent Cassini observations of the moon to a child shaking a wrapped gift, trying to figure out what the package conceals. 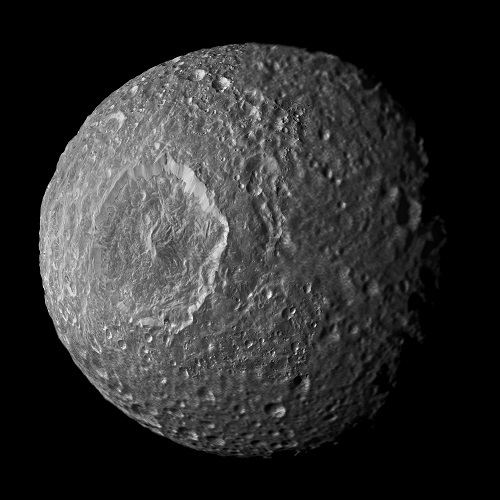 ‘Shaking’ Mimas in a similar way through analysis of the Cassini data has revealed what might be a sub-surface ocean, or an unusually-shaped core preserved since the moon’s formation. At work here is a technique called stereo photogrammetry, in which astronomers measure the moon’s libration around its polar axis. Libration is an oscillation or ‘wobble’ that can be studied by looking at Cassini imagery — taken by its Imaging Science Subsystem at different times and angles — and analyzing the images with the help of a computer model that involves hundreds of reference points on the surface. The amount of Mimas’ libration points to interesting things in the interior, but just what we still don’t know. Image: Cassini came within about 9,500 kilometers (5,900 miles) of Mimas during its flyby on Feb. 13, 2010. This mosaic was created from seven images taken that day in visible light with Cassini’s narrow-angle camera. An eighth, lower-resolution image from the same flyby, taken with the wide-angle camera, was used to fill in the right of the mosaic. The images were re-projected into an orthographic map projection. This view looks toward the hemisphere of Mimas that leads in its orbit around Saturn. Mimas is 396 kilometers across. The mosaic is centered on terrain at 5 degrees south latitude, 85 degrees west longitude. North is up. Credit: NASA/JPL. The ocean hypothesis sounds unlikely since no evidence of liquid water, thermal heating or geological activities have been reported on Mimas’ heavily cratered surface, contrary to Enceladus. Radiogenic heating alone could not sustain such an ocean, because the heat produced by the core escapes through the satellite’s icy shell and any ocean would freeze very quickly. One explanation could be found in Mimas’ high eccentricity (~0.02), whose origin remains unexplained, and may have been higher in the past. As a consequence, an ocean could have been formed and been sustained due to tidal heating. If it is there, the researchers think an internal ocean would exist under a crust between 24 and 31 kilometers thick. But what the data show us so far is simply a libration that is twice what we would expect from the moon’s orbital dynamics. This is a value that is being driven primarily by Mimas’ internal structure. The next step in the study of Mimas could proceed, the researchers suggest, by mapping the moon’s gravity field to uncover anomalies, by measuring tidal dissipation using astrometry from Cassini, or by measuring the heat flux at the surface. In the absence of other models to explain these findings, it would appear that Mimas has either an unusual core that is out of equilibrium or an internal ocean beneath thick ice. The paper is Tajeddine et al., “Constraints on Mimas’ interior from Cassini ISS libration measurements,” Science Vol. 346, No. 6207 (17 October 2014), pp. 322-324 (abstract). This Cornell University news release is also helpful. Could the impactor causing the prominent crater be sufficient to explain the libration, or was this ruled out in the Science paper? All these moons are ours! I like the way that sounds as a derivative of the similar sounding phrase in the second Space Odyssey Sci-Fi flick. A huge amount of resources are available to build starships, which will likely first be space arks sent out eventually in droves with headings all over our corner of the galaxy. I think we will eventually master extreme gamma factor travel, but that will take a big evolution in our power production capacity. Small moons like Mimas are appealing because of their small gravity well and ease of moving large masses on their surfaces such as in mining and space-ship part fabrications. Obviously, moons in close orbit around the gas giant planets can have quite a gravity well to climb out of but given the 170 or so known moons in our solar system, we have several if not many attractive options. Is it possible that the Herschel impact caused a deformation of the densier core which then became rigid again i.e. froze in place? Prehaps the impact liberated a large amount of volatiles in the mantle which made their way to the surface creating the voids. Would it make sense to send highly sensitive microphones to listen for activity beneath the surface? Maybe life evolving in such dark oceans would exploit acoustics in unique ways. Most cratering mechanics text such as “Impact Cratering” by H.J. Melosh conclude central peaks of complex craters are the result of stratigraphic uplift of strata beneath a crater do to compression rebound from the impact event. The central peak of Hershchel is about 6 to 8 km above the crater floor. So the central peak should contain material that was roughly that distance below the surface of Mimas before the cratering event. That would be a good place for a surface lander to investigate. If Herschel’s morphology isn’t the cause of the libration then maybe Michael is onto something. Don’t know if this is relevant to my comment above but the Cassini team have an image of Mimas’ northern regions from June 2012 that clearly show some deep, linear ‘trenches’ there… don’t know if they are aligned in the same fashion as the grooving on Vesta but maybe there’s a link to Herschell’s formation?